Slice each bagel into four thin rounds; quarter the rounds. Toast in a toaster oven until just golden. 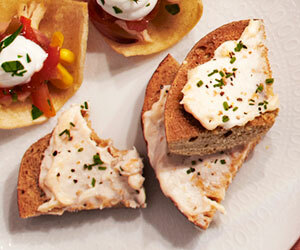 In a food processor, puree the cream cheese, sour cream, mayonnaise, smoked salmon and lemon juice until combined. Mixture should be fluffy. Spread the mousse on bagel chips and sprinkle with the black pepper and chives. Serve. PER SERVING: 93 cal., 3 g total fat (1 g sat. fat), 13 g carb. 4 g pro.